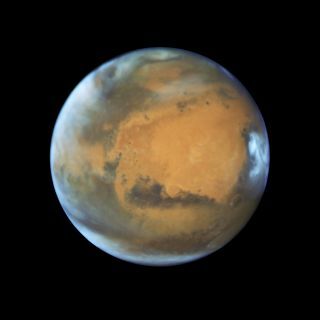 This global view of Mars was captured by the Hubble Space Telescope on May 12, 2016 ahead of the planet's arrival at opposition on May 22. The wide view lets scientists observe how climate impacts the entire planet. Mars is at opposition with the Earth this Sunday (May 22), meaning the Red Planet and sun will be on directly opposite sides of the Blue Marble. In celebration of this event, the Hubble Space Telescope snapped a new picture of Mars. The image shows a hazy blue rim around the dusty orange sphere. Space.com spoke with Jennifer Wiseman, a NASA Hubble senior scientist, about the benefits of observing Mars with different instruments, and the insights that Hubble has given scientists about our own solar system. The new Hubble image shows a wide variety of features on the Martian surface. The large orange region in the center is known as Arabia Terra, and is thought to be extremely old. Check out this video from Space.com to see the names of more of the physical features that appear in the new Hubble image. "You can see clouds around the whole planet and that's what you're seeing in that kind of wispy bluish white color," Wiseman said. "Off to the right-hand side you can see the clouds surrounding an extinct volcano. And you can also see the polar regions clearly. So this image actually gives us a huge variety of features that we can see." The Hubble telescope has produced incredible images of very distant cosmic objects, including thousands of galaxies, as well as gorgeous nebulas, and other jaw-dropping universal features. But Hubble has also unearthed incredible new information about Earth's solar system. "Hubble has been operating for over 26 years now and that means we have a long time-baseline of looking at planets in the solar system, including Mars." Wiseman said. "Because of this wealth of information, we can see how the planet as a whole changes over time. For planets like Jupiter, we've seen its atmosphere change, that red spot shrinking. For Saturn, we've seen things like the aurora on the poles come and go. We've even used Hubble to discover new moons around Pluto that we didn't know about before." On Mars, scientists have seen dust storms completely blanket the planet's surface. "It shows us that Mars is a very dynamic planet and we need that long time-baseline that Hubble has given us to really understand those dynamics," Wiseman added.